NASREC/Gold Reef City is an easy 15 to 20 minutes away against the major traffic. Sandton Convention Centre is approximately 12 minutes away and Morningside and Sunninghill Clinics, each about 15 minutes away. All units have a covered parking bay, a patio, small Bar-B-Q and TV. Towels and bedding are provided. Kitchens have all the necessary appliances, utensils and crockery. All units have a hair dryer, iron and ironing board and the use of a laundry for personal laundry. No smoking is allowed inside any unit. The Studio is a 2-sleeper unit consisting of one large room and a bathroom with shower. It has twin beds, a dining area, couch and a kitchenette. It is decorated in bright colours and very cheery. The kitchenette has a small fridge, microwave and electric frying pan. The Apartment is a 2-sleeper unit consisting of one large room and a bathroom with bath/shower. It has twin beds, a lounge/dining area and a kitchenette. It is decorated in natural tones and very relaxing. The kitchenette has a small fridge, microwave and electric frying pan. The Cabin is a 4-sleeper unit with one bedroom, bathroom with shower and large Lounge/Dining area/Kitchenette. It is decorated with an African Wildlife theme in warm tones. The bedroom has a double bed and the other room has a couch, which rolls out into a double or 2 single beds. The kitchenette has a small fridge, stove with 2 hot plates and a microwave. The Suite is a 4-sleeper unit with one bedroom, bathroom with bath/shower and spacious Lounge/Dining area. It is decorated with a Colonial theme in soft shades. 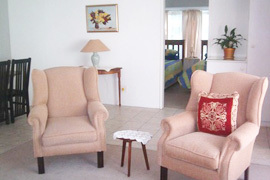 The bedroom has twin beds with additional twin beds adjacent to the dining area. It has a full kitchen with a family sized fridge/freezer, stove/oven, microwave and coffee maker. The Cottage is a unit with two bedrooms, one bathroom with shower, a lounge/dining area and a full kitchen. It is colourfully decorated in pastels creating a peaceful atmosphere. The main bedroom has a double bed and the large 2nd bedroom has 4 single beds. The kitchen has a family sized fridge/freezer, stove with 2 hot plates, an electric frying pan, and a coffee maker. For your convenience, tea, coffee, milk, bread, butter, jam, cereal and eggs are provided for your first breakfast, in all self-catering units, at no extra charge.